Semi panel van just good for door to door service . Beginning of January , many company or sole-proprietor looking for budget vehicle for their usage which can carry max weight 2,000KG including driver. I received plenty of messages/call/email just for van and semi panel quotation . 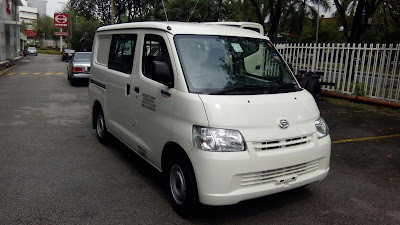 I'm fully recommend the most valuable and reliable to my client and today just deliver a Daihatsu granmax semi panel model S402RV-BMRFJG to a client today ! A budget less than RM65,000.00 for a new vehicle for door to door service. With fuel petrol which promise saving more times to wait for pumping diesel. 3 years or 100,000km warranty which ever come first and capacity of the carry weight up to 300KG + 5 workers and it's fit for pest control,technician service even small caterer ! Please do not hesitate to contact sales person.